FULL METAL SERVICE » RAPID STRIKE and DIENAMIC confirmed Japan tour 2013! RAPID STRIKE and DIENAMIC confirmed Japan tour 2013! 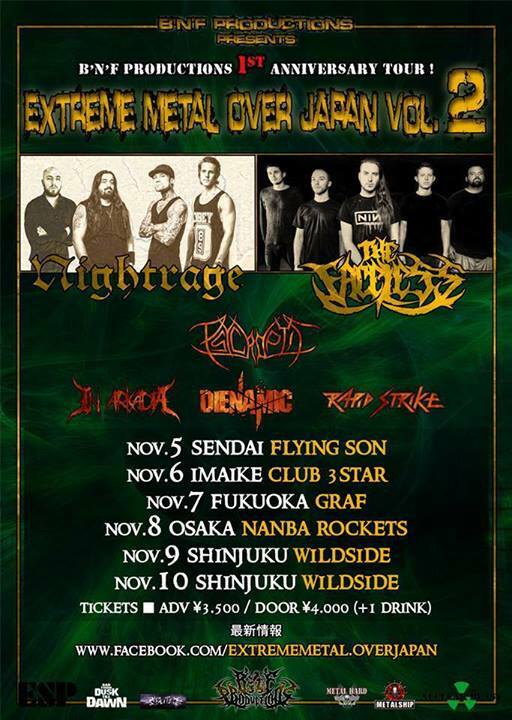 Full Metal Service ‘full package’ bands Rapid Strike and Dienamic just confirmed Japan tour in November 2013. Rapid Strike and Dienamic will visit Japan in November 2013. Expect lot of crazy photos, videos and of course tour diary! During one full week they will play on six shows including final, double sold out Tokio shows. Beside Nightrage, The Faceless, Psycroptic, Dienamic and In Arcadia shows, special Nightrage guest on this tour will be Gus G (Ozzy Osbourne / Firewind) on both Tokio shows. ← FMS launched Liburnian Records!